Roland Systems Group has provided free downloadable Windows video capture software for both its VR Series Video Mixers and VC Video Converters. 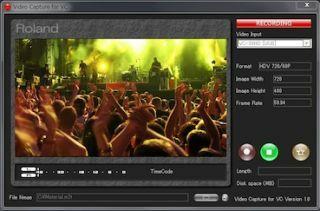 This capture software was developed to meet the request from Windows users who want to record/capture the audio and video during live events using any of the products from the Roland VR or VC line-up. The VR-3 and VR-5 all-in-one audio/video switchers use standard USB audio and video class output drivers for recording and web streaming—simply connect a USB cable from the mixer to the USB port on a Windows based computer running the free software to capture a live production to your PC. The VC version of the software functions the same way for the Roland VC-30HD and VC-50HD video converters. For VC-50HD users, simply connect a Firewire cable from the unit to your PC and use the software to capture. VC-30HD users can connect with either a Firewire cable or USB cable from the unit to their PC to capture. Mac users can record/capture with VR or VC products by using QuickTime and the “New Movie Recording” feature under the File menu.